On September 30, 1907, St. Louis Cardinals manager John McCloskey penciled the name Joe Delahanty into the lineup for a meaningless contest against the Boston Doves. A 31-year-old minor-league journeyman, Delahanty had recently been acquired by St. Louis and was about to be given a late-season look-see by the management of a club headed for a last-place finish. At the time, little thought was given to the effect that use of Delahanty might have on major-league history. But the moment the game began, Joe joined siblings Ed, Tom, Jimmy, and Frank Delahanty as a big-league ballplayer, and thereby expanded the ranks of the largest brother combo in the annals of the game. Perhaps incidentally for historical purposes, Joe went on to impress club brass during his audition, and spent the next two seasons as a Cardinals regular, thus becoming more than a novelty act. Once given the chance, Joe Delahanty proved a decent, if far from great, major-league player. The last of the five ballplaying brothers to reach the major-league scene was born Joseph Nicholas Delahanty in Cleveland on October 18, 1875. He was the sixth of 10 children born to James Delahanty (1842-1919) and his wife, the former Bridget Croke (1849-1926).1 Joe’s parents were Irish-Catholic immigrants who had arrived separately in Canada, met and married in Buffalo, and then moved to Cleveland, where James pursued work on the Lake Erie docks. Their ever-growing family settled in a commodious, two-story house close to a singular attraction for the Delahanty sons: a large vacant lot in almost constant use for baseball games. As soon as he was able, Joe, like his brothers Ed and Tom before him, and Jimmy, Frank, and Willie to follow, beat a path to that sandlot, much to the despair of the formidable Bridget Delahanty. Joe attended Immaculate Conception grammar school through the eighth grade, and then trained as a lithographer. But like his brothers, Joe’s heart was set upon a career in professional baseball. To that end, he played throughout the area, first attracting attention as a standout amateur player, thereafter with various semipro clubs. Joe began his professional career as a 19-year-old, signing with the Quincy (Illinois) Bluebirds of the minor-league Western Association. At 5-feet-9/168 pounds, the righty batting and throwing infielder much resembled his celebrated brother Big Ed, only in miniature.2 No individual Western Association statistics for that season survive, but Ed Delahanty biographer Jerrold Casway describes Joe’s stint in Quincy as “unimpressive.”3 Whatever the case, the Association folded in early August, and Joe soon found himself back in Ohio, serving as player-captain of the Cambridge club, “the amateur champions of the state.”4 After one false start in pro ball, Joe gave it another whirl in 1897, signing with the Fall River (Massachusetts) Indians of the more stable New England League.5 Joe began the campaign promisingly, “putting up a nice game of ball for Fall River, both hitting and fielding well.”6 But in early June, Fall River released Delahanty,7 his .344 batting average in 25 games notwithstanding. Sources conflict regarding Joe’s subsequent whereabouts. The Minor League Register places him with a New England League rival, the Newport (Rhode Island) Colts. Baseball-Reference concurs, but also assigns Delahanty to the Wheeling (West Virginia) Nailers of the Interstate League during the 1897 season. The Delahanty trio encored in Allentown during a shortened 1899 season. Appearing in all 86 Peanuts games, Joe upped his batting average to .344, with 44 extra-base hits, including an Atlantic League-leading 30 triples. He also stole 25 bases. Such performance did not go unnoticed by National League front offices, and at the conclusion of the season Delahanty’s contract rights were obtained by the Cincinnati Reds.12 But like numerous others, Joe’s advancement to the bigs was stymied by the consolidation of the formerly 12-team National League into an eight-club circuit for the 1900 season. With interest in him relinquished by the Reds, Delahanty returned to Allentown to play a third season with brothers Tom and Jimmy. But not for long. On June 12, 1900, the Atlantic League folded, leaving the Delahanty brothers to scramble for berths elsewhere. Joe had burnished his re-employment credentials during the abbreviated Allentown campaign, batting a torrid.468 (67-for-143), and again leading the league in triples (11). Stepping up a competitive notch, he signed with the Montreal Royals of the top-tier minor Eastern League.13 But there, his numbers slackened to a .248 BA in 54 games. In early 1906 veteran player-turned-minor-league entrepreneur Art Irwin was granted the Altoona (Pennsylvania) franchise in a new independent minor-league circuit, the Tri-State League. Taking a page from the Bill Sharsig playbook, Irwin then announced his intention to stock his club with Delahanty brothers, more particularly, Tom, Jimmy, Frank, and Joe. But Irwin wanted all four of them “and would not accept any of the [Delahanty] contracts unless all four agreed to sign” with him.24 Given that Jimmy and Frank Delahanty were reserved by major-league clubs for the coming season, the Irwin announcement was probably more publicity gambit than serious proposition. But Tom and Joe were reunited nonetheless, signing with another Tri-State League club, the Williamsport (Pennsylvania) Millionaires.25 Tom, now 34, had little left, and was released in the early going. But Joe turned in a typically solid season, batting .279 with 45 extra-base hits, including a league-leading 17 triples. The following season, he was even better. Limited by injuries to 108 games, Joe posted a league-best .355 BA. Then, at the close of the Tri-State league season, his major-league chance finally arrived. In September 1907 the talent-starved St. Louis Cardinals purchased 31-year-old Joe Delahanty from Williamsport.26 For the next three weeks, he sat on the bench. But when given a start against Boston on September 30, Joe made the most of it. In his major-league debut, he went 3-for-4 against right-hander Gus Dorner and stole three bases in a 5-1 Cardinals win. The next day, a first-inning Delahanty home run off Sam Frock provided the margin of victory in a 2-1 St. Louis win. In all, Joe got into seven late-season games, batting .318 (7-for-22), playing competently in the outfield, and, perhaps unexpectedly, carving a niche for himself in Cardinals’ plans for the 1908 season. After a solid spring camp in 1908, Delahanty was given the Cardinals left field job and held it all season. His .255 BA, while modest, far exceeded the St. Louis team norm (.223). To that, Joe added a little much-needed pop, 26 extra-base-hits and 44 RBIs, for a woeful (49-105) cellar-dwelling club. He also provided reliable outfield defense (.977 FA).27 Another thing doubtless appreciated by club brass was the absence of any sign of the notorious family temperament. Apart from the quiet, stable Tom, the Delahantys had always been a handful. The late Ed, perhaps the most gifted batsman of the 1890s, was a troubled man, beset by drinking and personal problems that often set management on edge. Jimmy and Frank Delahanty were worse, temperamental and contrary malcontents who wore out their welcome quickly wherever they went in baseball. Even minor leaguer Willie Delahanty was something of a prima donna, regularly at odds with management and often suspended. Joe Delahanty, however, was strictly professional. Whatever his private demons – and Joe later developed a gambling problem28 – he did not let them interfere with his play on the ballfield, and caused no headaches in the front office. Rather, the cause of Joe’s downfall was a more commonplace one: the inability to sustain an adequate level of performance on the field. In 1909 his hitting tailed off markedly. In 123 games he batted only .214, substandard even on a team as bad as the last-place (54-98) Cardinals. His defensive versatility remained an asset. In addition to the outfield, Joe played 48 games at second base, albeit with 20 errors and a .905 FA. But his age (soon-to-be 34) and a front-office inclination to clean house worked against him. That winter, St. Louis sold the Delahanty contract to Toronto of the Eastern League,29 bringing Joe’s late-starting major-league career to an end. In 270 games, he had batted .238, with 49 extra-base hits and 100 RBIs. He stole 24 bases and scored 68 runs. He had also been a capable outfield defender (.978 FA), and a good citizen in the clubhouse. In Toronto, Joe had two respectable seasons (1910: .287 BA, with 41 extra-base hits; 1911: .265 BA, with 34 extra-base hits); but a nagging injury to his throwing arm and the march of time put the end of his playing days in sight. Given his unconditional release by Toronto in March 1912, Joe tried to prolong his career by signing with Cleveland Forest City in the newly organized United States League.30 He tore up the pitching of this major-league pretender, hitting .414 (24-for-58) in 16 games. But the USL collapsed after three weeks play, rendering Joe a free agent once again. 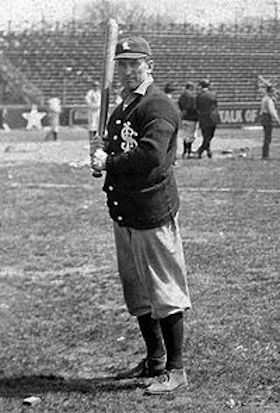 Delahanty finished his 16-year pro career playing for the Wilkes-Barre (Pennsylvania) Barons of the Class B New York State League, batting .273 in 44 games. Although his time in the majors was limited, Joe had often been a force playing one level below. He posted a career minor-league batting average of .303, with 1,636 base hits and 201 stolen bases. While hardly a star like his brother Ed, or even in the same talent category as brother Jimmy, Joe had been a competent professional and far from the least accomplished of the six ballplaying Delahanty brothers. Professional baseball was not the only thing abandoned by Joe Delahanty. On November 24, 1914, he also surrendered his long-standing bachelorhood, marrying fellow Clevelander Anastasia Hayes (1880-1948). The union would endure for the remainder of Joe’s life, but produce no children. Long an offseason lithographer, Joe made an occupational change, as well. In partnership with Willie, he opened Delahanty Brothers, a neighborhood tavern that later became a family restaurant with the advent of Prohibition. He also kept his hand in the game, playing in the Cleveland fall semipro league, usually on a team with Jimmy, and occasionally alongside Tom or Willie. In the mid-1920s, the family was riven by dispute over the custody and care of Bridget Delahanty, by now widowed and in declining health. Eventually, guardianship of mother Delahanty was wrested from her strong-willed daughter Katherine and conferred on Joe. But this did little to alleviate family tensions as his brothers did not trust Joe’s wife. By the time of Mrs. Delahanty’s passing in 1926, her middle-aged children were largely estranged from one another and squabbling over distribution of her modest estate.31 Meanwhile, Joe’s Democratic Party connections had secured him the position of Cleveland deputy sheriff. Assigned to serving warrants in the civil division, he would hold this post until his death. Like other family members, Joe developed heart disease as he aged. But on January 29, 1936, it was a stroke (cerebral hemorrhage) suffered at home that claimed the life of Joe Delahanty.32 He was 60. Following a Funeral Mass at St. Philomena Church, he was laid to rest near deceased family members in Calvary Cemetery, Cleveland. His immediate survivors included wife Anastasia, his sister, Katherine Maguire, and his brothers Tom, Jimmy, Frank, and Willie. Sources for the biographical info provided herein include the Joe Delahanty file maintained at the Giamatti Research Center, National Baseball Hall of Fame and Museum, Cooperstown, New York; Jerrold Casway, Ed Delahanty and the Emerald Age of Baseball (South Bend, Indiana: University of Notre Dame Press, 2004); Delahanty family tree information posted on Ancestry.com; and certain of the newspaper articles cited below. Statistics have been taken from Baseball-Reference, Retrosheet, and The Minor League Register, Lloyd Johnson, ed. (Durham, North Carolina: Baseball America, Inc., 1994). 1 Joe’s siblings were Edward (born 1867), Thomas (1872), Katherine (1874), James (1879), Florence (1880), Frank (1882), and William (1885). Two other Delahanty children, a baby girl (name unknown, born 1866) and Martin (1868), did not survive infancy. 2 Once he made the majors, Joe’s resemblance to Big Ed Delahanty was frequently noted in the baseball press. See, e.g., Sporting Life, July 13, 1907, the Washington (DC) Evening Star, March 30, 1908, and the Watertown (New York) Daily Times, April 29, 1908. Years later, Clark Griffith remarked that all the Delahanty brothers “looked alike, and there were about 73 of them.” Mike Sowell, July 2, 1903: The Mysterious Death of Hall-of Famer Big Ed Delahanty (New York: Macmillan, 1992), 116. And as with his brothers, Joe’s surname was frequently spelled Delehanty by the sporting press. 3 Jerrold Casway, Ed Delahanty and the Emerald Age of Baseball (South Bend, Indiana: University of Notre Dame Press, 2004), 149. 4 According to Sporting Life, September 8, 1896. 5 As reported in the Boston Journal, April 22, 1897, and the Cleveland Leader and Washington Evening Star, May 5, 1897. 6 Sporting Life, May 22, 1897. 7 As per Sporting Life, June 5, 1897. 8 Sporting Life, May 28, 1898. 9 Sporting Life, June 18, 1898. 10 Casway, 150. The Allentown signing of Joe Delahanty was reported in Sporting Life, July 2, 1898. 11 As quoted in Sporting Life, September 24, 1898. At the time, Ed Delahanty had already registered two .400-plus batting averages for the Philadelphia Phillies and was arguably the best hitter in all baseball. 12 As reported in Sporting Life, October 7, 1899. 13 As per Sporting Life, July 28, 1900. 14 As subsequently reported in the Worcester Daily Spy, April 11, 1902. Johnson won the mayoral election handily. 15 As reported in the Worcester Daily Spy, March 19, 1902, and Sporting Life, April 5, 1902. 16 As per The Minor League Register, Lloyd Johnson, ed. (Durham, North Carolina: Baseball America, Inc., 1994), 84. Baseball-Reference credits Delahanty with only 39 extra-base hits in 1902 and provides no stolen-base data for that season. 17 As reported in the Worcester Daily Spy, April 5, 1903. 18 As revealed in the Denver Rocky Mountain News, June 12, 1903. 19 For detailed accounts of the tragic death of Ed Delahanty, see Casway, 259-282, and Sowell, 255-280. 20 Jimmy Delahanty, now playing with Southern Association rival Little Rock, batted .383. Although neither had sufficient at-bats to officially qualify for the league batting crown, Jimmy and Joe Delahanty posted the top two batting averages in the SA for 1903. Cleveland Plain Dealer and New Orleans Item, December 15, 1903. 21 As per Sporting Life, October 3, 1903. 22 As per the Worcester Daily Spy, February 1, 1904, and Jersey (Jersey City) Journal, February 5, 1904. 23 Willie Delahanty had entered the pro ranks in 1904, signing with the Haverhill Hustlers of the Class B New England League, only to be cut prior to the season’s start. He saw his first professional action in 1905 with the Niles Crowites of the Class C Ohio-Pennsylvania League. Willie would remain in Organized Baseball through the 1912 season but he never reached the major leagues, the only one of the six ballplaying Delahanty brothers who failed to do so. 24 As reported in the Denver Rocky Mountain News and Richmond Times-Dispatch, January 4, 1906, and elsewhere. 25 As reported in the Jersey Journal, April 12, 1906. 26 As reported in the Boston Herald, September 1, 1907, Washington Evening Star, September 2, 1907, and Sporting Life, September 7, 1907. 27 Joe’s .977 fielding average was the highest posted by a National League left fielder in 1908. 29 As reported in the Washington Evening Star, December 18, 1909, Watertown Daily Times, December 24, 1909, and elsewhere. 30 As reported in the Cleveland Plain Dealer, April 17, 1912, Miami Herald, April 27, 1912, and elsewhere. 31 See Casway, 288. After costs and funeral expenses, the estate was divided into six equal shares of $1,336.77. 32 As per the Death Certificate in the Joe Delahanty file at the Giamatti Research Center.